"Where's Wally?" the debut album from Wally Boy Wonder contains a semi star studded line up of regional and national musicians... And it shows. Shawn Hackel (formerly of Filter), Matt Cleary (formerly of Warrant), Mark Sterle (renowned wind instrument player), Eric Baltrinic (formerly of The Twist Offs) and, of course, Wally Boy Wonder (street poet, rap battle champ, writer, producer). The acclaimed underground release sold out in its first pressing. Just about everyone who heard it had to have a copy. Unfortunately, the CD was self released and lacked proper promotion and distribution. Fast Forward to 2009. The CD is discovered by Intolerance Records. Wally is signed and begins work on his second release. The rights to "Where's Wally?" are transferred and the underground CD is brought into the limelight of mainstream music. Take everything you know about the rap game, now throw it out the window. 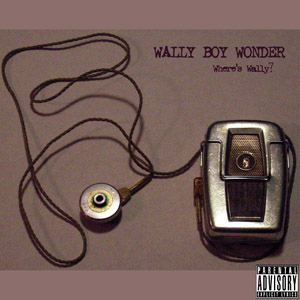 Wally Boy Wonder blends elements of Hip Hop, Rock, Folk Music and more in this catchy, creative ode to pop culture. A lover of horror films and collector of horror memorabilia, Wally's unique insight and viewpoints provide an eye opening perspective on current events. Blessed with a tongue as fast as his brain, his rhymes defy the laws of science in a most unique and memorable manner. E-Music / HipHop Politics Pick Of The Week! ©2009 Intolerance Records, a division of JShep. - All Rights Reserved.